I went to Confession tonight before vigil Mass. I was the last one in the pastor's line. 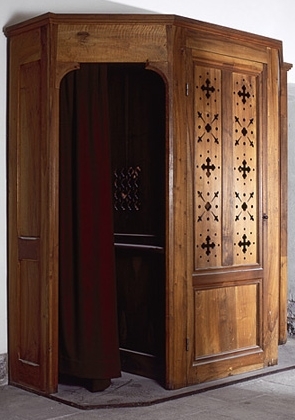 As I walked into the confessional, the pastor was walking out, as if he were finished. Confession had only been in session for an half-hour, but I volunteered to go to the other priest if he needed a break. He huffed at me to come in and shut the door. The anonymity was blown now, but that's OK. I began to explain a moral situation about which I am confused, when he interupted and told me that he doesn't have time to listen to stories, to just get to it. So I slapped a label on the prospective sin and moved on to the next one. Before I could get to the third sin on my list, he tells me to say 5 Hail Marys for my penance, to say the Act of Contrition. Then he rattles off the absolution prayer. I thought maybe he was in a hurry to prepare for Mass, but Mass was offered by the associate pastor. In fairness, this pastor has serious health problems. I didn't confess all of the sins of which I was aware, but I withheld them basically at the priest's insistence. I had the firm and sincere desire to confess fully but was not allowed to do so. Am I absolved? So was this Confession sacramentally valid? In the ensuing discussion, it was confirmed that it was valid. I have frequently encountered this attitude in the confessional: an unwillingness to listen, to take the time and counsel the penitent, and a rushed attitude. I realize that priests are spread thin, and they have many obligations. But what is more important than confessing sins? I can understand that some penitents might get into a shaggy dog stories if they're not told to get to the point. But five minutes in the confessional should not be too much to ask especially if there isn't a big line-up. I think grassroots Catholics hunger for their priest's attention-- the serious ones in any case. They want fatherly advice. They want the priest to take the time to be with them. I have often felt like some priests only devote time to certain categories of Catholics. If you weren't among the weak and vulnerable, if you were a run-of-the-mill bourgeois Catholic, the priest couldn't make time for you and your concerns. I wish we could somehow reform confessional practices so that priests welcome their penitent's questions about how to behave. Isn't that the point of consulting Father? And if priests can't take your extensive laundry list of sins, perhaps there should be some kind of protocol. Say: if you have more than x sins to confess that week, make an appointment. It's very disheartening to go to Confession with a burning concern, a strong desire to confess a particular sin, and to be brushed off in the name of efficiency. There has to be a better way.